Frederic Remington is one of the most well known American artists of all time. His works documented the American west better than any artist of his generation. Remington was born in Canton, New York and he and his family later moved to Ogdensburg, New York. He attended art school at Yale University, but returned home when his father died. He made his first trip out west to Kansas where he became a businessman and married his wife Eva. In his early artistic life he spent much of his time developing illustrations and sketches for Collier's Weekly and Harper's Magazine. All of his work had a decidedly western theme. In 1898, Remington became a war reporter for the Spanish-American War. It was during this time that he met Theodore Roosevelt, who was commanding troops in battle. After the war, Remington returned to New York where he began applying his artistic talents to the art of sculpture. His first sculpture was called Bronco Buster (also spelled Broncho Buster). By this time his old friend Theodore Roosevelt had become president and presented his first sculpture to him as a gift. This sculpture still resides in the White House today. Frederic Remington died at the young age of only 48 due to complications from appendicitis. As time passed, Frederic Remington's work stood out as authentic depictions of the American west at a the time of the real cowboys and Indians. His original works are highly sought after by museums and private collectors and when they change hands the value is in the tens of millions of dollars. In 1984, Remington's Mountain Man was selected as the commemorative bronze for the inauguration of President Ronald Regan. After his death, other sculptors recreated numerous other pieces based on his illustrations. These works were not actually by Remington himself, but are referred to as "inspired by Remington." 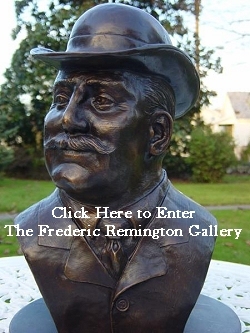 Below is a complete list of Remington's original statues that we have available. To view our entire Remington Collection Gallery, click here.